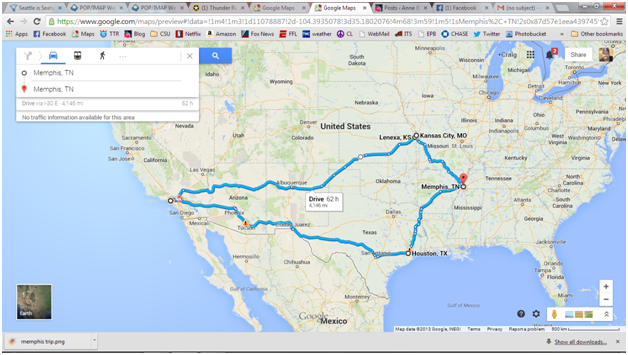 So here is our trip this week. So ready to roll. This entry was posted in CDL Team, Truck Driver and tagged Anne and Craig Leonard, anneandcraigleonard, Cascadia, CDL Blog, Craig and Anne, dogs in a truck, driving blog, f2f, Farm2fleet, Freightliner, Husband and wife teams, inside a semi truck, married truck driving teams, owner/operator, peterbilt, Peterbuilt, Pro Star, ProStar, Semi Interior, Team Truck Driving, Trucking Blog, Trucking Contractor, US Express, US Xpress, USX, video of inside of truck, Volvo 780. Bookmark the permalink. Glad to read that you guys are rolling again! I was starting to have my doubts about this whole O/O thing going on. looks like a great run!! here’s to smooth travels! !